This is more or less the perfect card for slower combo decks in casual settings. The mana cost is barely a drawback in late-game-centric settings like Commander and other types of large-group multiplayer, and it's arguably a fair price considering that it literally lets you sculpt the perfect hand. The fact that it makes you discard your hand is also barely a drawback, as you may well have no cards in hand in that sort of late-game setting. 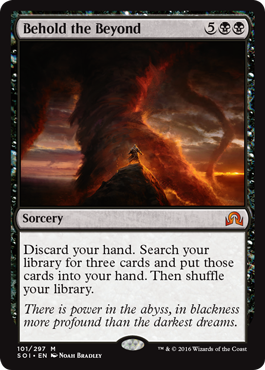 Plus, the fact that it involves discard rather than exile or something else is actually a gift in disguise: I'm not sure I can even describe what would happen if you combined this card with Living Death. A 7 drop madness enabler that's also a triple tutor. It's interesting considering it's only a late game thing, if you can even afford 7 mana plus madness costs. I suppose Meren EDH likes it.